Departing from Quito you will flight over the Andes to Coca city. Here begins the adventure. From there, you will be taken to the Orellana port to get on board a motorized canoe to navigate downstream the Napo River. During the unforgettable trip you will see some birds such as herons, kingfishers, hoatzins and other species. After a two hours trip, you will get to the Kichwa Añangu community to then embark on a dugout canoe for a 1 to 2 hours ride along a peaceful narrow stream that connects to the Añangu Lake. On the way, you will probably see different species of monkeys, large birds as macaws, toucans and giant otters. At your arrival to the Napo Wildlife Center which is on the banks of the Añangu Lake, you will be welcomed with a refreshing drink and some snacks and taken to your room. Most days in the Amazon Rainforest are sunny or rainy as climate is considered warm-humid and it does not vary from month to month. This means that any time is perfect to travel to the Napo Wildlife Center. What to eat in the lodge? In the Napo Wildlife Center, meals are all included. You can choose from the great variety of food, from local, national to international dishes. What to take to the Amazon? Some basic things to take to the Amazon are: mosquitos repelet, sunscreen, 2 or 3 t-shirts, 2 or 3 long-sleeve shirts, 2 or 3 lightwear pants, cotton socks, a pair of comfortable sneakers, sandals to be at the lodge. Do not leave candles or smoke inside them. Swimming in the Añangu Lake is forbidden. If you want to take photos of natives ask first for permission. On the boats use always life jackets and shoes. When going on excursions on the forest or the surrounding gardens use rubber boots, especially at night. 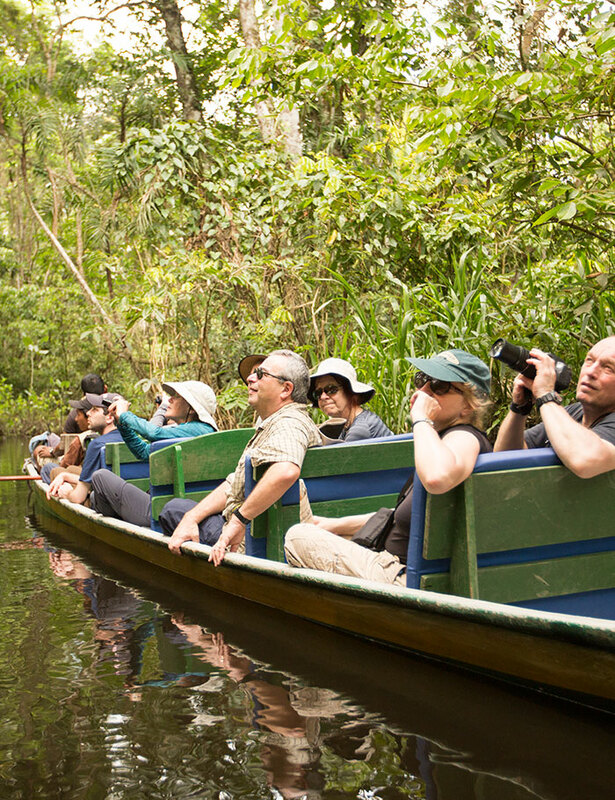 When you see wildlife on excursions to the jungle follow the guide’s instructions.